Molineux is one of the most distinctive stadiums in the country, being one of the earliest post-Taylor-report grounds. 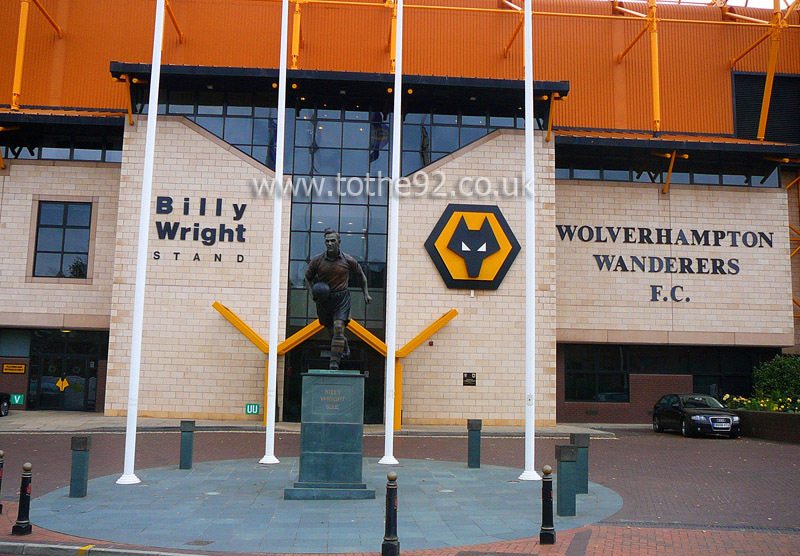 There are four large stands named after historical Wolves figures; the Billy Wright and Steve Bull stands running the length of the pitch, and the Stan Cullis and Jack Harris stands behind the goals. The more vocal fans are situated in the Jack Harris stand. 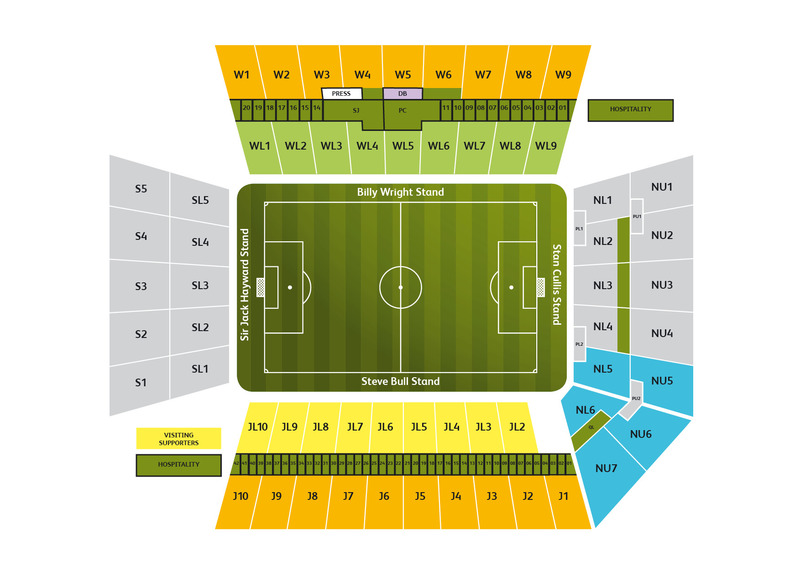 An allocation of 2,750 tickets are available to visiting supporters and are located in the upper and lower tiers of the Stan Cullis Stand at the North end of the ground. The view of the playing action is unobstructed and generally very good. Refreshments are various and not over priced whilst facilities are very good. Much as you would expect from a new stand. There are a number of pubs dotted around the ground, but they tend to be for home supporters only. The Great Western, behind Wolverhampton train station is a great pub but it is sadly quite small, and away fans must not wear colours. The Litten Tree in the city centre is away fan friendly. The Prince Albert pub also nearby to the station should be avoided. The best fish and chip shop close to the ground is in Staveley Road. Be aware that there is nearly always a queue but it's certainly worth the wait once you're there. The special meal deals are particularly good value and very tasty. Elsewhere there are a few burger stalls dotted around the stadium. Parking is limited in the surrounding area but the best option seems one of two. You can drive towards the town centre and parking is available in many pay and display car parks here ranging between £3 and £6 for five hours. The other option is to travel up to the stadium and use one of the official football parking car parks which are signposted. Both options are a short walk back to the ground. The nearest / closest train station to Wolverhampton Wanderers' Molineux Stadium is Wolverhampton. This is approximately 10 minutes walk from the ground. Leave the station and proceed straight on towards the town centre and as you reach the inner ring road turn right. Just follow the ring road as it continues in a circular pattern around to the left. Eventually you will see the Molineux on the right. Travel: I had a tip from a Wolves fan, and it turned out to be a pretty good one! Leave the M6 at Junction 12, follow Stafford Road all the way towards town, turn left at a roundabout with the Island pub next to it, and lo and behold, free match day parking at a park and ride! Only about a 10 minute walk to the ground from there, and traffic not so bad afterwards. Spot on! Refreshments: You can't really go without here. Decent selection inside the ground with burgers, hot dogs, pies, the usual, and outside, curries everywhere you look! As far as getting a drink goes, I'd always heard Wolves can be a bit of a moody away, but a pub a little way away from the Stan Cullis Stand opposite the Asda called the Goal Post was heaving with Blues mixing with home fans with absolutely no bother. They served curries too and put on what looked like a free barbecue buffet which had sadly all been gobbled up by the time we got there! Impressions: Given that the Steve Bull Stand is the oldest in the ground, I was very surprised just how good it was! Away fans who take the full allocation as we did take the whole of the lower tier of the stand, and despite it not having many rows and us being in row B, it was really steep so even that low down, the view was pretty good! The ground looks quite steep all around, and is built in a valley, so while it feels quite big and imposing once you're inside, it looks and feels quite small on the outside. Atmosphere: It wasn't bad. Wolves fans were pretty quiet until they started getting on the ref's back, which in turn lifted them a bit to get behind their team more. Away fans struggle to get anything going, as they were so spread out. Maybe that's why they put us in the side? Enjoy: Very good, I really enjoyed it. One of those grounds that has everything you're looking for in an away day. Somewhere to eat and drink, not too far away or hard to get to, decent away end, decent atmosphere. A new contender in my list of favourites! Travel: I used the club transport provided by Bristol city, The coach park needs to be a little bit closer to the stadium as it was a bit of a walk especially as we were outnumbered by home supporters! Pubs: Luckily enough there was an Asda Supermarket directly outside the away end so that was handy! The stadium itself had plenty of match day burger vans all the way down to the ground itself! The away fans were told to go to the walkabout pub, not too far from the coach park but about a 5 minute walk from the away end of the ground! The food/drinks inside the stadium were fairly priced(thankfully as the weather was dreadful) and was enjoyable to eat. Impressions: The stadium on the outside didn't look too bad from the outside! Although the away ends location is very weird as it is right below home supporters in the main stand so the views weren't too great either. The ground had a friendly atmosphere as there was no trouble getting too and from the coaches before and after the match, there was the usual football banter between home and away supporters even though us city fans didn't have a lot to cheer about as we lost 3-1. Facilities: The stadium had all its basic facilities, food places and toilets inside the stand. The leg room wasn't great! I'm only 5"9 and I was quite cramped so I couldn't imagine being one of the taller fans. The stands roof didn't do much protection either, full of leaks towards the front. Exit: Exiting the stadium is quick and easy although there was a 5 minute walk back to the coaches. Getting out of Wolverhampton wasn't too bad either as the blocked off a couple of lanes to allow us to leave. Enjoy: Despite the scoreline I did enjoy my trip to Wolverhampton and I would love to go back again, I would recommend this stadium as in my opinion it is one of the best I have been to. Have you been to Wolverhampton Wanderers' Molineux? To tell us about your experiences and to feature on the site, simply complete the fans review form below!